According to a new biography of former First Lady Barbara Bush, the matriarch of the Bush Clan said that when she first met Donald Trump in the 1980’s she viewed him as the “symbol of greed” in the United States. She also claimed that the stress he put on her family during the 2016 presidential election helped cause her heart attack. Ring of Fire’s Farron Cousins examines these claims to see if maybe there’s something else that could have been troubling her. 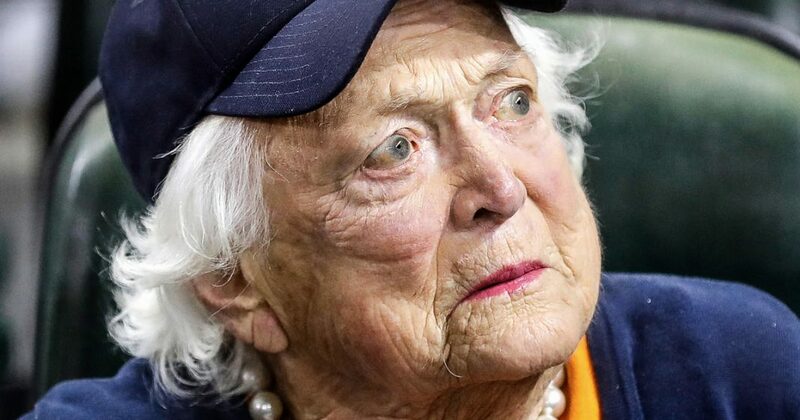 So there’s a new biography coming out of Barbara Bush. The book is titled the Matriarch Barbara Bush and the making of an American dynasty by author Susan Page. Now, Susan Page spent a lot of time talking with Barbara Bush. A lot of this book is based on the interviews that she had with the former first lady. And in the book, Barbara Bush, who passed away last year said that when she first met Donald Trump and the 1980s she thought that he personally was a real symbol of greed all the way back in the 1980s. You know, at the time, Donald Trump wasn’t necessarily the big household name that he was even before he ran for president. But even back then she knew it. She could see it as good, most people who had actually met or seen the man. But then things take a weird, weird little turn here. You see, Barbara Bush had a cardiac event, a heart attack, something of that nature. In June of 2016, uh, you know, the summer right before the 2016 presidential election. And during an interview, the author says that Barbara Bush kind of implied that Trump, you know, the stress that he put on her family, the attacks that he had on Jeb Bush, her son that helped, you know, create the anxiety and the stress that led to her cardiac event. I don’t know how I feel about that, you know, look, I hate Trump. He bugs the hell out of me. He’s corrupt as hell. He’s downright evil. And he is absolutely one of the worst presidents we’ve had in my lifetime. But there were two other presidents during my lifetime that were also pretty crappy and they happen to be Barbara Bushes son and her husband. And I think that for her, you know, at a time when, yeah, it’s great. It’s popular. It’s cool to dog on Trump and blame him for everything. But, and I don’t want to attack a, a former first lady who’s passed away. However, don’t sit there and just try to jump on the Anti Trump bandwagon. Okay. Your son started in illegal war, your son’s decisions resulted in the deaths of over a hundred thousand civilians in Iraq. Thousands of US soldiers dead based on an illegal war. And yeah, Trump is awful, but he hasn’t even done that yet. He’s done his own evil bad things. But your son was just as bad and more people died under your son and technically your husband too with the first Gulf War. So yeah, you want to throw stones and say that this guy is a horrible piece of crap. I’m all for it. But your was no better. Your other son, Jeb, the one who got attacked by Donald Trump was also a horrible human being. And again, it brings me no joy to sit here and basically be yelling at a former first lady who’s not alive. But I don’t agree with this assessment to say that Donald Trump calls my heart attack or he played a role in it. No, no. The public disliked your family because of what your son did and what your husband did and what those of us down here in Florida saw what your other son did. Don’t blame Donald Trump for that. Those are your kids. You know, and I, and I, uh, I don’t, I don’t even get to say it. I’m not even gonna say it. I’m not even going to bring it up, but you have to take responsibility. Maybe Trump did cause you a lot of stress, but a lot of the attacks other than the low energy Jeb that he laid on your family were based on facts. Your son started an illegal war while he was president that resulted in the deaths of hundreds of thousands of people across the planet. You can’t escape that. That is his legacy. He can’t escape that. That should have caused you stress. That should have caused anxiety. That should have caused a phone call to say, Georgie, what the hell are you doing? A lot of times we see people like this. Hell, we saw it with Lee Atwater, the inventor of a dirty tricks for Republican campaigns. You know, uh, basically trying to make amends while he was on his deathbed saying, oh, I regret everything. It’s so sad and sorry, oh, I wished it hadn’t become this way. I think that’s what we, we saw here with these interviews of Barbara Bush, right? She understands that her kids were horrible. She understands that her husband was not a great president and she was trying to atone for that by saying, yeah, but look how bad this guy is now. And unfortunately a lot of history is going to look back in the same way, cause sure, in comparison, living in this moment, Trump does seem worse than Bush, but I can promise you to the people who weren’t reporting on it or covering it or even paying attention back then, things felt this way during the Bush administration to Barbara needs to, or needed to, I guess understand that. Yeah, her family produced bad politicians and that is not Donald Trump’s fault. A lot of bad things happening in the country today are Trump’s fault. So attack him for that. But to try to somehow say that he was responsible for your health problems, that’s a stretch. And it’s a stretch against the guy that I personally despise. But even I’m not willing to buy into that.